Arabian Sea (Nov. 17, 2006) - The Pakistani Naval frigate PNS Tippu Sultan (D 185) prepares to come alongside the Military Sealift Command (MSC) fast combat support ship USNS Supply (T-AOE 6) for an underway replenishment (UNREP). Supply is under way in the 5th Fleet area of responsibility to help the fleet sustain its length at sea in order to conduct maritime security operations. Persian Gulf (Nov. 21, 2004) – The Pakistan Navy destroyer PNS Babur (D 182) operates in the Persian Gulf as part of the Coalition Maritime Campaign Plan conducted under Commander Task Force One Five Zero (CTF-150) in the 5th Fleet area of responsibility. Babur is designed to provide effective defense of a convoy or other force against attack by surface ships or submarines. Coalition forces are working to prevent attacks against critical maritime infrastructures in the region, including the oil and shipping industries, and stopping the flow of terrorist and terrorism related materials. 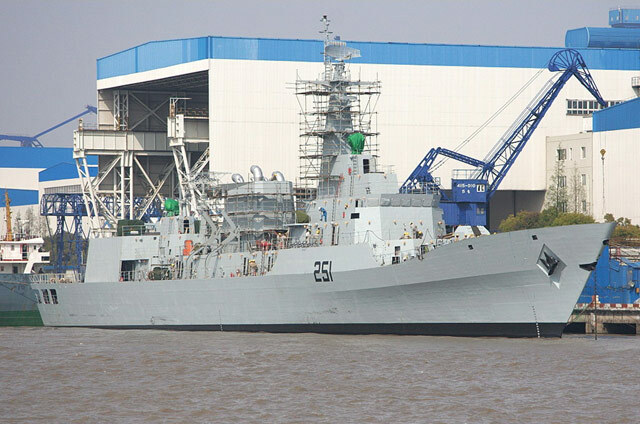 Islamabad, Oct 17 : As part of its plans to acquire modern warships, the Pakistan Navy will acquire four frigates from China by 2011 and the first of these vessels will be inducted into the force next year. "Four F-22P Frigates, being manufactured in China, will be included in the fleet of the Pakistan Navy by 2011," Commodore Kamran Khan, commander of the navy's destroyer squadron, told reporters on board the warship PNS Babar in the Arabian Sea today. Under a plan to modernise its fleet by 2025, the Pakistan Navy will acquire modern submarines, warships and aircraft, he said. Three F-22P frigates are being manufactured in China while the last one will be built in the Pakistan Naval Dockyard in Karachi. The first frigate will be included in the fleet next year. "Under a transfer of technology agreement with China, Pakistan will be able to start manufacturing warships in 2010," Khan said. Under the navy's modernisation plan, the government has been asked to provide the force more warships and submarines. New P-3C aircraft are being purchased from the US for aerial surveillance, he added. Khan said the Pakistan Navy is fully capable of safeguarding its maritime obligations. One warship of the Pakistan Navy is always present in the Indian Ocean with the fleet of the allied forces, he said. China will also build and launch a telecommunication satellite for Pakistan. Contracts for the satellite deal were inked during the just-concluded state visit of Pakistan President Asif Ali Zardari to China. Pakistan will use the satellite for domestic telecommunication and broadcast services. The satellite's chief contractor -- China Great Wall Industry Corporation (CGWIC) said that a 'Long March 3B' rocket will be used to put the satellite into orbit in 2011. The company said ground control facilities for the satellite will be handed over to the Pakistan Space and Upper Atmosphere Research Commission (SUPARCO) after it enters orbit. CGWIC and its sub-contractors are responsible for the design, manufacturing, final assembly, testing and launch of the satellite. The satellite, 'PakSat-1R' will have a life span of 15 years. As part of Beijing's effort to position itself as a reliable and cost-effective space benefactor to the developing world, the communist giant has already announced plans to build and launch satellites for countries like Brazil and Venezuela. Damen tire bien son épingle du jeux !